Scott Abel hosted a full day of content strategy talks with many big shots of the industry at tcworld11 (the international half of tekom11). Strategies and case studies by Joe Gollner, Ann Rockley & Charles Cooper, Aaron Fulkerson (of MindTouch), Rahel Ann Bailie & Geoff Roberts, and Noz Urbina were followed by a panel discussion for which Ray Gallon joined them. The content strategy panel, left to right: Scott, Joe, Rahel, Ray, Ann, Noz, Charles. Click to enlarge. Photo by @umpff, used with permission. Intelligent content, said Joe, is actionable information that exposes itself to people and machines. Such content (think tool-independent XML) is shareable, portable, resuable, findable and hence manageable. This makes content a strategic asset that can be leveraged to achieve business goals. Documentation should live up to marketing’s promise, said Aaron, but instead it’s too often a crappy pamphlet in the shiny box. A better, a 2.0 version of help lifts customers over Kathy Sierra’s passion threshold in a social help center. Aaron presenting benefits and key features of the Social Help Center. Click to enlarge. A social help center turns documentation into a social learning experience, and it doubles as your customer relationship management center. Supply the documentation basis and empower your existing client base to augment it: Enable peer-to-peer learning for all the unique search terms on the documentation long tail that your documentation does not or cannot cover. Once you install success metrics, you can even use documentation to find what customers use and need to drive sales. 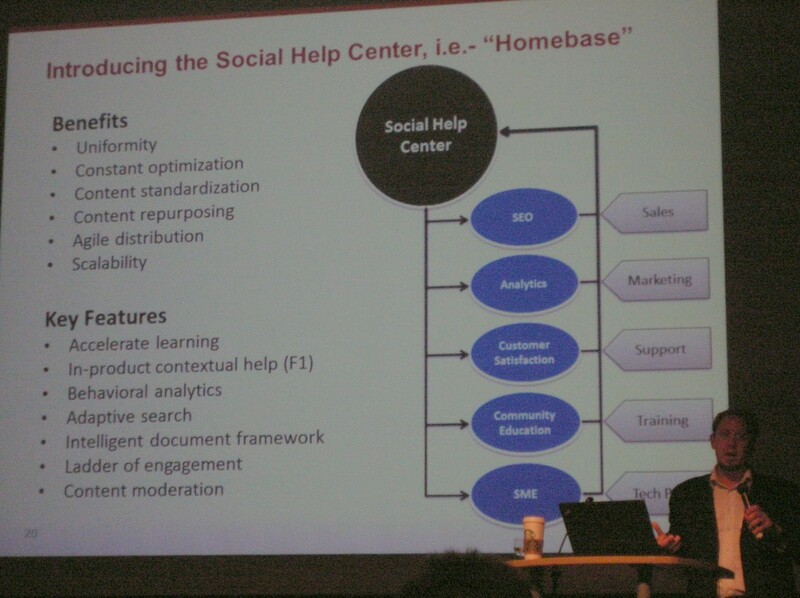 For an example of a social help center (built using MindTouch), visit http://wikihelp.autodesk.com/. To read more about Aaron’s argument, see his Forbes’ article “The Evolution Of User Manuals“. I came away with a extended take on content strategy. I still believe that content strategy means to break down silos between different producers of content within an organization, for more efficient and effective communication with consumers, whether they are customers or colleagues. Breaking down content silos among content stakeholders is a daunting task for a technical communicator: You need to get product management and marketing, training and customer service, along with your colleagues, all in the same boat. But depending on your corporate culture, this might still be something that can be driven from inside tech comm, with enthusiasm and a clear mission. Larger corporate content strategies, as Joe and Noz presented them, essentially change the way an organization works. You still need all stakeholders on board, but you also need a mandate from management, a budget, and most likely some consulting help. Better not. You only get one shot, so you can’t afford to blow it. Better get the help of an experienced consultant who speaks management’s language. Most of it. Because consultants don’t do the actual work, they teach and enable technical communicators. In the end, I think I saw the vanguard of content strategy and learned as much about this exciting field in a day as possible. I may well have seen one future of technical communications and will benefit from knowing its principles and objectives. But a mismatch between the message and the audience remains: Much of what I learned seemed directed at managers, but not something I could apply in my current job as technical communicator. So for now, I’ll stick with breaking down the silos which is more within my reach. For a more applicable example, check my post on Ray Gallon’s webinar about “Content Strategy for Software Development”. How do you think content strategy applies to technical communicators? Feel free to leave a comment. Hmm. Much CS talk here aimed at management level. Roger’s rant (mentioned in a previous post somewhere) about the “hipster” CS consultants, not tech comm people, grabbing the attention of management. If no one is helping us (tech comm) with learning CS or practicing CS, we really are on our own and really must fight our own battles. Just a thought that bubbled up on reading your excellent report. Thanks, Karen, that was my impression as well: As convincing as the arguments sounded, it was creepily unclear whether content strategy is driven by us tech comm’ers in the trenches – or done unto us… And one thing we don’t need is another line separating “us” from “them”! You’re sleepwalking into obsolescence at the hands of skinny-jeaned Hoxton web twats. I had to look it up, but Hoxton is a “vibrant arts and entertainment district” north of the financial district of the City of London, according to Wikipedia. Agreed – we need to work together, not separately. I guess we have a pile of work in front of us! Thanks, Kai, for an excellent summary — and for the link to the MindTouch wiki. Good stuff. And I agree with what you and Karen have said in the comments about tech comm’ers in the trenches. Let’s ride forth together. Thanks, Larry. I get so much out of bloggers’ reports of conferences I cannot attend, I’m glad to share my impressions of the ones I can visit! During my keynote presentation at tekom/tcworld, I spoke about “socially-enabled support content” (aka “Help 2.0). The best examples thus far are ones that are directly attached to revenue. Techcomm has for far too long been associated with a “cost center”. This has got to change. I suggest you check out ifitxit.com to see the future of technical communication. Strategically, this approach is a winner. I’ll be writing and speaking about it over the coming months. Kai, you are spot on about the content strategy summary. Content strategy is NOT about technical writing. It’s about management. Not documentation management. It’s about management. It’s about how an organization will use its resources to achieve its goals. It’s high level and attached to metrics. It’s about money, time, cost, expense — in short, mathematics. And, science. Not language arts. Some technical communicators may make good strategists, but most lack the skills needed, which include, but are not limited to excellent business presentation skills, the ability to tell compelling stories that are directly attached to organizational goals and provable with financials and other metrics, persuasive team building (getting a lot of people on your side by speaking their language and finding ways to solve their problems as well as yours), excellent self-promotional skills, the ability to grab the attention of key decision makers and stakeholders. There’s a lot of psychology and marketing involved. And, frankly, many technical communicators are not good at this, just like I am not good at singing. Why I might want to be a superstar vocalist, no matter how much training, I’m just don’t have the skills needed to be great. Could I be a decent vocalist? Probably not. While I can read music, am a dj and mashup artist, and I am musically-inclined, I am not a vocalist because I cannot sing. Many technical writers might be good at creating content, but that does not mean they would be good at being advocates for changing the way an organization creates, manages and delivers information. Additionally, the tekom conference is not limited to technical communicators. It’s loaded with technical communication managers. I also met information architects, product managers (who, of course, care about product content). training and eLearning developers, video and simulation producers, as well as a host of translation and localization pros. All of us together, combined with loads of help from other roles, make up the many cogs in the content lifecycle. This is the process that needs to be optimized and made efficient. Content strategy can help with this, hopefully, freeing the worker bees up to have time to innovate and implement the strategies our organizations adopt moving forward. Thanks, Scott! Wow, your enthusiastic reply is a post in itself! I’m all for demonstrating how documentation contributes to a company’s assets. But I still spend much of my time raising awareness among colleagues why the implicit cost center is a problem. Or among managers that I actually have a (business) case. In my experience, tech writers aren’t the only ones who have a hard time thinking documentation and business together. Kai, thanks for this complete review. While I agree generally with your notion yhat it’s aimed at managers, many tech comms do a bit of, or a lot of, content strategy in their work, and if an organization has a content strategy then everyone, tech comms included, needs to understand it and be on board. This is why discussions like the one we had are important for all. I agree with Scott except I think he must have it in for an old English teacher ;-). Having good writing skills is still important, even for content strategists. Being a comma pedant, however, is not. You’re welcome. It was my pleasure to learn from all of you!